This is the third installment of a three-part series. Check out part one and part two as well. Following the epic photo shoot with the delightful Sweet Hope, we devoured a breakfast of toast, fruit, and fried rice aboard the klotoks, and then disembarked. 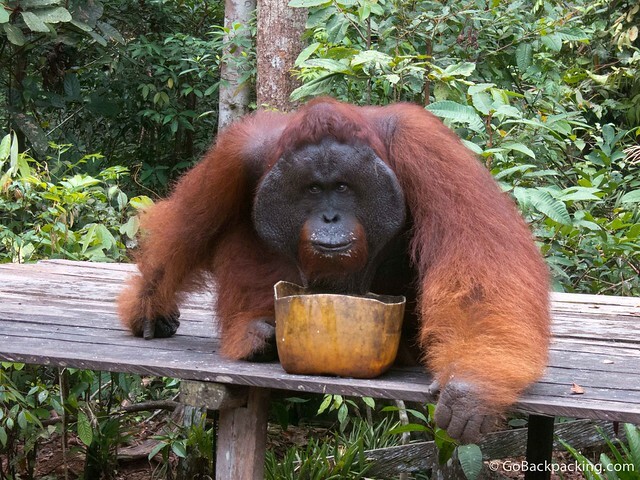 By then, two dozen other tourists had arrived to watch the morning's orangutan feeding. We walked a few minutes along another raised boardwalk, until we reached the ranger station. Behind one of the buildings, a mother orangutan was hanging from a tree trunk, along with her adorable little baby. The mother was making a distinct noise every thirty seconds, her way of warning us not to come closer, but as one guide mentioned, a sign of impatience as she awaited the morning feeding as well. Female orangutans raise their young for 7-8 years before parting ways. This is timeframe is the longest of any mammal, besides humans. Remember, orangutans and humans share 97% of the same genetic code. 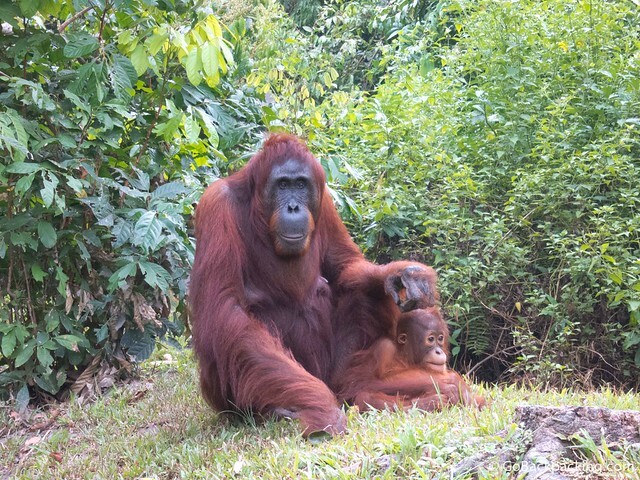 The long period of time mothers devote toward raising their young is another example of how easy it is to relate to the behavior of orangutans. It's easy to think they are similar to us, but in reality, it is we humans that are similar to them. Got Milk? 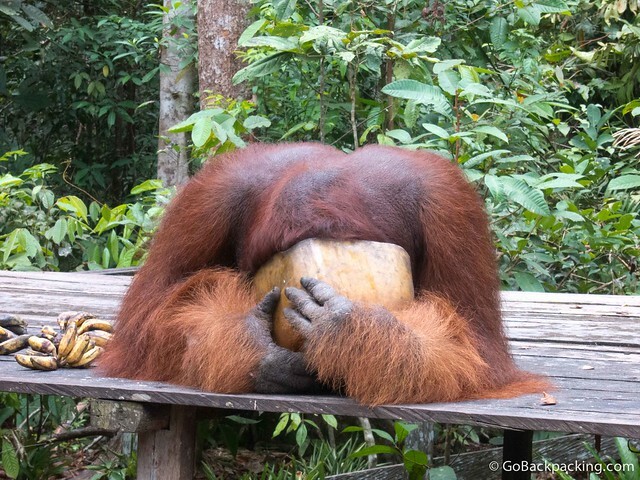 Tom, an alpha male orangutan, slurps up vitamin-enriched milk at a park feeding. A few minutes before 9 AM, we proceeded further into the jungle to a raised wooden platform. Bundles of bananas, along with a yellow plastic bucket of vitamin-fortified milk, were placed out. In the distance, a large nest of leaves and branches could be seen perched high up a tree. There was a rustling, and then the profile of a large figure slowly descending the tree trunk. Tom, an alpha male orangutan, was making his way to the food. 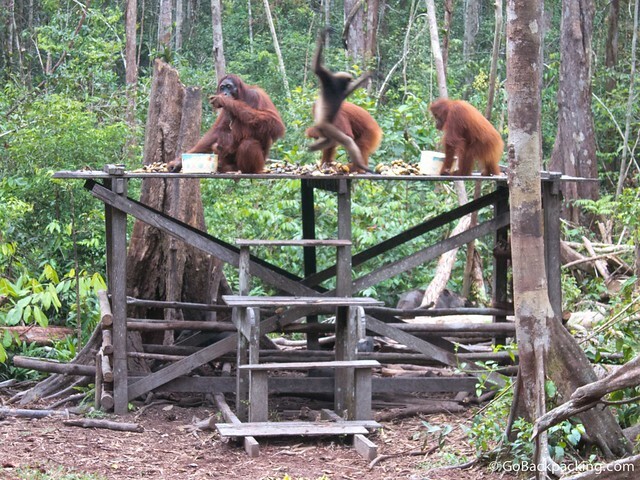 None of the other orangutans in the region would approach the platform while he was on it. As a dominant orangutan, Tom gets to eat first, unless another dominant, or up-and-coming male orangutan chooses to challenge him. Dominant males, like Tom, can be distinguished by their large cheek pads, which can appear in as little as six months. Not all male orangutans will grow them, and it's believed that certain males are genetically predisposed to be dominant. Disturbing but true is the fact that Tom's preferred mating partner is his mother. Once Tom had consumed his fill of milk and bananas, he departed the platform. 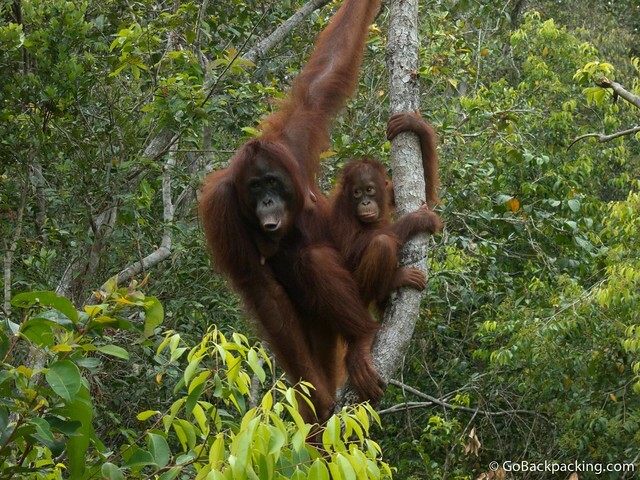 Within a few minutes, the mother and baby descended a tree to collect bananas, as did other medium-sized orangutans. 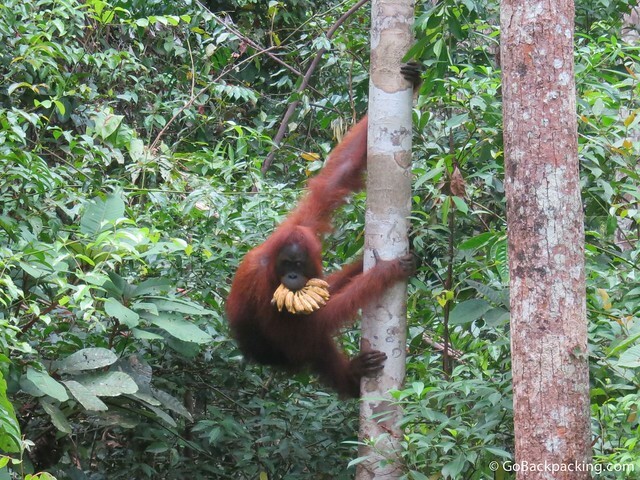 Most of the orangutans chose to grab the bananas and return to the tree tops to consume them. Orangutans spend most of their time in the tree canopy, where they're less likely to run into danger. After observing the second feeding, we headed back to the klotoks, and a boat ride further upriver to Camp Leakey, where the observation and preservation of wild orangutans in Borneo first began, decades earlier. 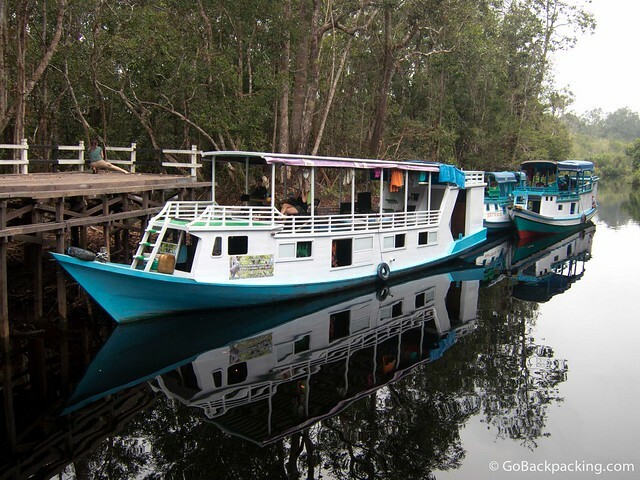 Tanjung Puting National Park features several species of primates, in addition to orangutans. 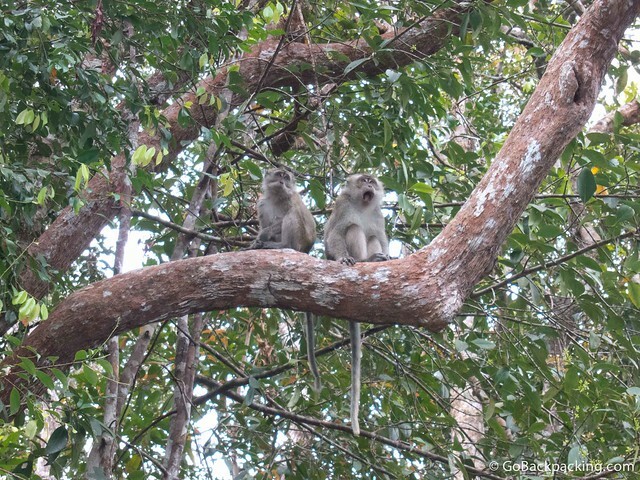 Crab-eating macaques (aka long-tailed macaques) are easily distinguished due to their grey color, and long tails which often hang perpendicular to tree branches. Proboscis monkeys are also common, especially at dusk in the trees along the river. They are identified from a distance by their orange color hair, though they also feature very large noses (and thus the name). According to our guides, the male monkeys are known for always being ready to mate. Specifically, they always have an erection, which makes it hard to motor past them without a good laugh. In addition to these two species, and the orangutans, you can also spot the occasion gibbon in the park, as we would soon find out. Other interesting animals include: sun bears, clouded leopards, red leaf-eating monkeys, and crocodiles (one of which is known to have attacked and killed a tourist on the river's edge near Camp Leakey). By the time we reached Camp Leakey, the water had turned dark black. Contrary to what you might think, the black water is actually cleaner than the brown water we'd seen downriver. Unfortunately, there's a mining industry that sends a steady stream of pollutants downstream. The black water is the natural color of the unpolluted water. Camp Leakey was established in 1971 by Dr. Birute Galdikas and Rod Brindamour. Galdikas was encouraged in her dream of studying wild orangutans in the forests of Southeast Asia by the late paleoanthropologist Dr. Louis Leakey who also mentored Jane Goodall and the late Dian Fossey in their respective studies of chimpanzees and mountain gorillas. At Camp Leakey, we first toured an information center filled with photos of the local orangutans, and information gained from the tens of thousands of hours of study that have happened there. Today, the biggest threat to the already endangered orangutans is deforestation. As jungle is cleared to plant palm oil plantations, or mine for precious minerals, the orangutans are losing their habitat. Without the trees, they lose their source of food, as well as their home. While they are protected within Tanjung Puting National Park, it occupies an obscenely small portion of Indonesian Borneo, and the island of Borneo altogether. Orangutan Foundation International (OFI), which was set up by Dr. Birute Galdikas in 1986 to help protect the orangutans, is actively making an effort to buy additional land, as well as educate the local land owners and workers. Sadly, many Indonesian workers come from other islands, and having no experience with these large, yet gentle primates, kill them out of fear alone. We heard one such story from Freddie Galdikas, son of Dr. Galdikas. He told us about how an orangutan, in search of food, was in a tree on a plantation. The orangutan wouldn't come down, and the workers, unsure of what to do, lit a fire at the base of the tree, which eventually lead to the orangutan's demise. Another threat comes from poaching. As the mother's take care of the young until 7 or 8 years of age, the poacher's must kill the mother in order to kidnap and sell the baby. Baby orangutans are sold for $1,000 in Jakarta, and more in Thailand, where they are kept as pets. These stories are heartbreaking to hear, and after hearing them direct from Freddie, who grew up around the orangutans at Camp Leakey, I had to get involved. Orangutan Foundation International offers a host of ways to protect and save these beautiful creatures. There are a variety of products that can be purchased online, and for as little as $100, you can foster an orphan orangutan, or sponsor an acre of land in the Rawa Kuno Legacy Forest. OFI is trying to raise $640,000 to purchase 6,400 acres of critical forest habitat. Every $100 donated allows you to sponsor one acre of forest. This was the option I chose. Whether you choose to help by sharing this article via social media, and thereby helping to educate others about the plight of orangutans, or by donating yourself, I ask that you please do something. The Orangutans of Borneo may be endangered, but together, we can still work to protect and save them.